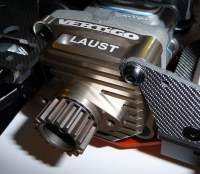 - Vertigo Performance Vented clutch cover protects clutch assembly from debris which can cause premature wear on the clutch shoes. - We all know a clutch cover needs to be enclosed however what is going to let the heat escape? We vented ours in a protected area at the rear tucked up with the brakes. - Access hole also allows you to clean out your clutch with an air line when used with Vertigo VPP1651ST, VPP1652, 61651 and 61652 Vented Clutch Bells. - Finned, we added cooling fins to further extract the heat by creating a greater surface area for air movement around the cover.